Ranked as America's forty-ninth largest law firm by the National Law Journal, LBBS understands that improving productivity pays real dividends. "Anything that saves an attorney time is a huge help to clients," says Arthur Leeser, information technology director at LBBS. "If we can eliminate unnecessary hours, then we make better use of our client budgets." Early on, the firm demonstrated its commitment to employing cost- and time-saving solutions. 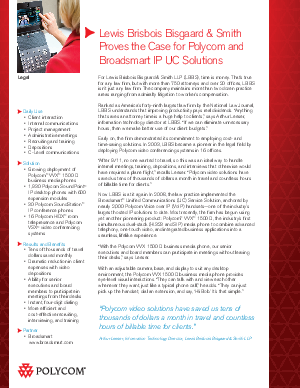 In 2003, LBBS became a pioneer in the legal field by deploying Polycom video conferencing systems in 16 offices.